Yesterday, I found myself chatting with a therapist in the middle of a public square in New York. That’s not a normal occurrence for me – I was testing out Talkspace, an iOS app and Web service for chatting with licensed therapists. 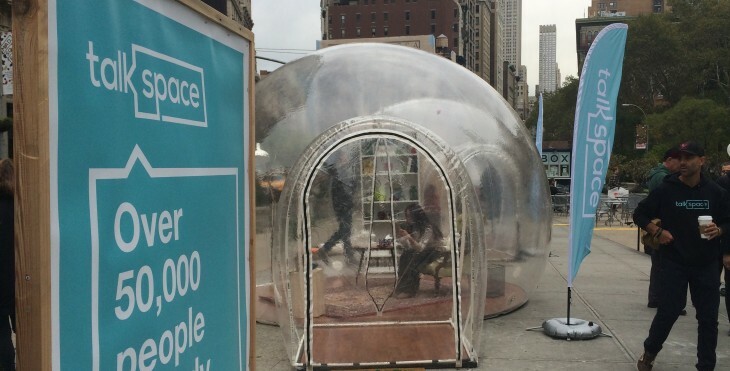 The company had setup fake living rooms inside inflated domes in order to convince people to give the app a try. Face-to-face therapy is expensive. Many of us need it, but it’s difficult to find the time and money to make it happen. There’s also a lingering social stigma about going to a therapist. Talkspace is trying to break down each of those three obstacles. Asynchronous chat lets you message your therapist whenever you have time. If you’re frustrated after coming out of a tense work meeting, you can vent in the moment instead of having to wait until your next appointment. Text therapy is also cheaper, costing as little as $25 a week for unlimited messages if you pay by the month. Finally, using an app or a website is relatively discreet. Hopefully someday we’ll live in a world where mental health treatment is treated the same as physical issues, but until then, you can always tuck the app away in a folder on your last screen of icons. If you’re worried about friends snooping on your chats, you can also set an app-specific unlock code. Unfortunately, I didn’t see that option on the website, so you’ll want to log out if you’re letting anyone else use your computer. I gave the app a brief try to talk to a therapist about the grieving process. It was surprisingly easy to open up via text, but the truth is I’ve been conditioned to do so from the decades I’ve spent using email, IRC, IM, SMS, messaging apps and more. For younger generations, face-to-face time is awkward and texting is second nature. Talkspace co-founder Oren Frank said in an interview that dozens of studies have shown text-based therapy to be at least as, if not more, helpful as traditional methods. He also noted that using chat creates a journaling effect by allowing patients to scroll back and reread conversations. Therapists can also refresh their memory about your case before responding. The startup decided on messaging after talking through use cases with therapists. It discovered that clients were already texting feedback to their therapists, but the conversations kept getting cut off. “All the clients are trying to move to text. This is how we isolated it,” Frank said. Therapists benefit on their end, too. A number of counselors use the platform as their sole source of income. They can work from anywhere and are no longer dependent on foot traffic. I spoke with Talkspace therapist Christy Paul to find how talking to patients virtually works for her. Paul said she doesn’t miss the non-verbal cues that come from talking in person. While it does take her some time to understand a client’s tone, that’s also true in real-life as well. Patients also seem more willing to provide feedback over chat about how things are going. “I feel like patients are more honest texting than face to face,” she said. Paul handles her caseload by responding to chats in the morning and evening. She works about the same number of hours, but now her office can be anywhere. Involving the cloud in something as personal as a therapy session does introduce some data risks, but Frank reassured that Talkspace has taken security seriously, going above and beyond government requirements. The company doesn’t have access to your chats, which are encrypted at 256-bits. You can also choose to use the service anonymously, as payment information is submitted through a third-party processor. “I would actually go as far as saying that I would be much more confident with our system than your original practitioner’s system in the office,” Frank said.